Earrings complete your fashion statement.There are earrings for all occasions -the office, casual outings, your wedding, a night on the town, or a day at the beach. Your earrings define your personality; creative, subtle, sophisticated, exciting or shy. The main characteristic of stud earrings is the appearance of floating on the ear or earlobe without a visible (from the front) point of connection. Studs are invariably constructed on the end of a post, which penetrates straight through the ear. The post is held in place by a removable friction back or clutch. It is appropriate for any occasions. Leverback give a secure way to wear the earring and will not bring the trouble of sticking your hair. hoop earrings are circular or semi-circular in design, and look very similar to a ring. They are often constructed of metal tubing, with a thin wire attachment penetrating the ear. The hollow tubing is permanently attached to the wire at the front of the ear, and slips into the tube at the back. The entire device is held together by tension between the wire and the tube. 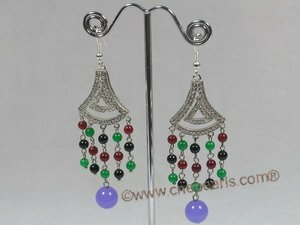 This style of earring has multi-level branches that hang down from the earring base.Normally gemstone briolettes hang from the branches.Chandelier earring just add some kind of exotic feeling. Clip earrings are a rage with women who haven't had their ears pierced. 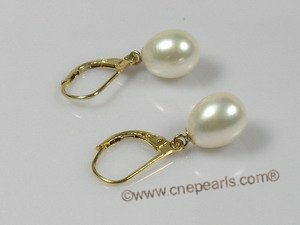 Such earrings are fixed with a tension clip and it is pinched to the earlobe. Clip earrings come as studs or hoops. Some pierced earrings come with options to convert them into clip earrings too. Because pearls are natural organic substances, they can occur in a wide variety of shapes, many of which are quite unique and interesting. The round pearls you most commonly see are by no means the only shape in which pearls are found! Indeed, perfectly round pearls are actually quite rare. This is because the eventual shape of the pearl is determined by a number of highly variable factors which occur inside the oyster as the pearl is developing. For example, the pearl often assumes the same shape as its nucleus (the irritant which was placed inside the oyster to initiate the formation of the pearl). If the nucleus is not perfectly round, the resulting pearl is likely to reflect this irregularity. In addition, the pearl's positioning within the oyster also plays a role in determining its shape. If the pearl develops against the shell, for example, it will become more flattened on that side. 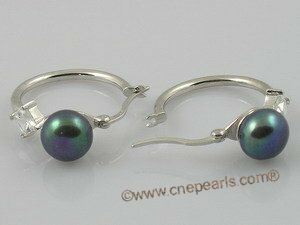 The term off-round is used to describe pearls which are 'roundish' to the eye but have a slightly oval or flattened shape. They can still have excellent qualities in terms of lustre or lack of blemish but being off-round makes them less expensive. Before the cultured pearl industry began in the early 1900's most natural wild pearls were off-round or baroque (a general term for an irregular shape). 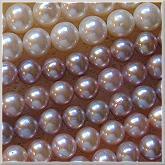 Off round pearls can provide excellent value for money. 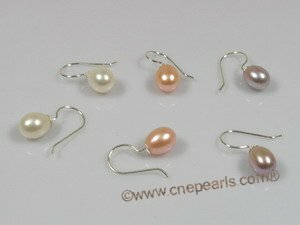 Oval pearls are sometimes also known as rice pearls although this is a slightly misleading term. It comes from the early days of Chinese freshwater pearl production when large numbers of low quality pearls came onto the market and were derided as 'rice-crispies' after the cereal. Today, Chinese freshwater pearls can compete in quality with the world's best. 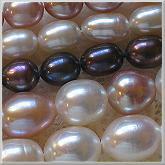 Oval pearls come in a variety of sizes and colours. Sometimes they are formed when two pearls growing close to one another in the same mollusc join together. Many of these are button pearls, so-called because of their distinctive shape - round on one side and flat on the other. Button pearls are flattened to some degree, making them resemble a button or perhaps a disk rather than a perfect sphere. 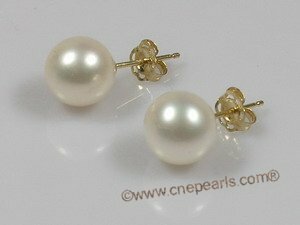 These pearls are often used in earrings, where the flattened side can be attached to the setting. Buttons are also categorized as symmetrical. The term 'Biwa' derives from Lake Biwa - a large freshwater lake near Kyoto in Japan. This was once the focus of the Japanese freshwater pearl industry. In the 1980's pearl production there virtually ceased due to industrial pollution. 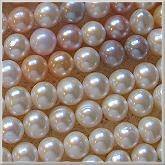 Biwa became a generic name for all freshwater pearls regardless of their shape. Technically it is incorrect to call pearls Biwa pearls (like French fries or English muffins) unless they actually come from Lake Biwa. 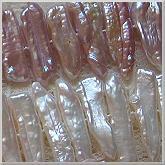 We use the term simply to identify the unique shape of these particular pearls. 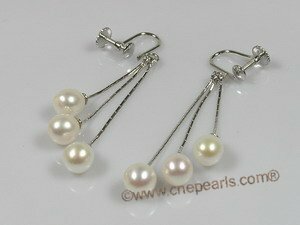 This page contains all entries posted to wholesale jewelry,pearl jewelry,cultured pearls in March 2009. They are listed from oldest to newest.